3s and 4s relished their early starts at Jamison, getting the ball rolling for the red men with big wins in both games. 4s remain unbeaten, and look to be going from strength to strength as a number of familiar faces start to return and string some games together. Beau Mokotupu managed 4 tries in the 78-7 victory, while Cameron Shaw and Murphy Meafua were also somehow able to get their hands on the ball (generally following rucks where Mokos had been tackled) to score multiple tries of their own. 3s recorded an equally impressive 76-17 victory, with the tries being slightly more shared around and Jack Howard pulling the strings at fly half. The side was well served by Marcus Maletasi and Semisi Qualova, and will be looking to maintain their momentum and keep winning to assure themselves a place in the finals. 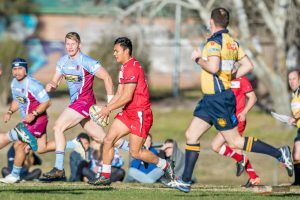 Colts did well to maintain their composure to record a 75-0 victory in a game which threatened to turn ugly on a number of occasions in the second half. The side scored some fantastic team tries after heeding the lessons of the previous week to hold onto the ball and string together multiple phases. With Isaak Weston and Keiran Place the standouts in an impressive forward pack and Liam Bevan cashing in on the quality ball he received to score a hat trick competition for spots in the side is starting to become heated. The boys will be eager to overturn the close loss they suffered in their earlier clash with Gungahlin this weekend, before heading to an intensive training camp with Coach Allardyce on the bye weekend. 2nds again were forced to come from behind to record a 22-15 victory that was only confirmed with a late virtuoso try to standout backrower Jayme Field. Having been dominated in the early physical exchanges the pack did well to claw their way back into the game, while the result ultimately turned on a brilliant defensive play from centre Trai Henderson which lead directly to Field’s try. A win on the weekend will be vital in shoring up a spot in the major semi and give the side some breathing space as it waits for players to filter back from injury heading into the business end of the season. Unfortunately 1sts were unable to make it 5 from 5 for the day, with the pack getting steamrolled in a timely reminder about the increased intensity required in finals football. Whilst the effort of the side cannot be questioned, and heart will be taken from the passages where they were able to hold onto the ball, the side will need to pay plenty of attention to its defensive technique and attitude and set-piece if it is to be a serious contender this season. Len Ikitau’s sparkling display at outside centre in his starting debut was undoubtedly a bright spot, with his centre partner Andrew Robinson and fullback Sam Giltrap also very effective in attack. The club welcomes Gungahlin in all grades at Viking Park this weekend, with all support appreciated.